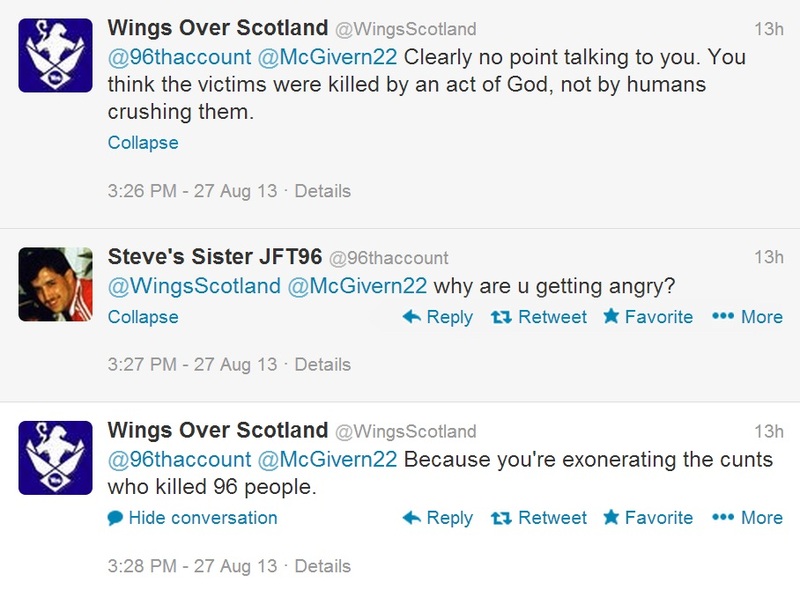 WINGS OVER SCOTLAND is arguably the most recognisable example of citizen journalism in Scotland today. Primarily designed to challenge inaccuracies in the mainstream media, the site has featured a diverse set of contributors, even giving platform to those with opposing views such as Ukip MP Douglas Carswell and discredited former Labour MP Eric Joyce. Founding blogger 'Reverend' Stuart Campbell is the man who posts the vast majority of content on the site. Most people agree that he's an intelligent bloggerwith a firm grasp on the mechanisms of Scottish politics and undeniably provides a vital alternative to the unionist media consensus. Of course, you probably know all of this already. Wings has amassed nearly 50,000 Twitter followers and is read more than many newspapers, at least if social media reach and newspaper circulation figures are anything to go by. In 2012, Stuart Campbell wrote a hideous blog where he regurgitated the long-standing myth that Liverpool fans 'killed their own'. The site has been hailed as an example of new media, even if it lacks the plurality of voices that Bella Caledonia or CommonSpace has. There's nothing wrong with this - people think Campbell is a commentator worth listening to. But he's also a very provocative character and he knows it. He even brags about it: according to the site's 'About Us' page , he's been described as "a maniac", a "cretin" and "the vilest person possible". Granted, some of the comments are from Daily Mail journalists (pot, kettle etc. ), but he seemsto have upset an awful lot of people just by being exposing the truth as he sees it. The trouble is that some of these 'truths' have included questionble views about transgender people among other things. Then, of course, there are his disgraceful comments on the Hillsborough tragedy in which 96 Liverpool fans lost their lives. I'm not going to repeat all the facts as you all know them already. Even if you were previously oblivious to the Hillsborough families' heroic campaign for justice over the past 27 years, you'll have inevitably seen the categorical verdict of the inquest: the fans were unlawfully killed. I have family and friends on Merseyside and know first-hand how affected Liverpool was by not only the disaster but the systemic cover-up that followed, therefore I'll not be too graphic about events which you can learn about in depth from various sources (here's a good examination of the disaster put together by The Guardian) . Yet Campbell went further still on social media, going as far as to call the Liverpool fans at the game "cunts". Still, it's a subject that requires bluntness. In 2012, Campbell wrote a hideous blog where he regurgitated the long-standing myth that Liverpool fans 'killed their own'. While he didn't go as far as high-profile figures like Boris Johnson or the Sun's Kelvin MacKenzie (the Sun, unlike Campbell, has at least issued half-hearted apologies), his twisted rationale was that, ignoring the fact that they were simply being directed by the officials at the ground, Liverpool fans should have known better than to push forward "in the apparent belief that the laws of physics didn't apply to football grounds". His conclusion was that the cause of death, irrespective of all other factors, was that Liverpool fans pushed forward. He completely disregarded the sheer physics of what happens when you ferry thousands of human beings into a packed area that is already at capacity. Even ignoring the fact that Liverpool fans weren't initially aware of the police's incompetence or how packed that part of the ground was, Campbell argued that crowds of people should somehow collectively ignore police instructions and cease moving forward. There have been various tragedies over the years that demonstrate that crowd control is the key issue here - 769 people died at last year's Hajj in Mecca, for example, due to a crush. Like blaming the fans at Hillsborough, the notion that the pilgrims themselves are to blame for killing their Muslim brothers and sisters at their holiest gathering is beyond contempt. After The Sun newspaper's lies and slander, the good people of Liverpool decided to boycott the newspaper and continue to do so to this day. They recognised that media must be held accountable for its actions. Yet Campbell went further still on social media, going as far as to call the Liverpool fans at the game "cunts". Fans who not only witnessed friends and family members dying but also attempted to save them were "cunts", according to Campbell . I don't even have to tell you how sickening that is. His comments didn't just lack a sense of logic, they lacked sensitivity. Campbell wasn't just characteristically provoking his readers, but demonstrating an absolute lack of empathy - ironic when you consider that many of his pieces on Wings are often moral grievances with various journalists and politicians. The inquest this week ultimately confirmed the truth that we've known for years: the Liverpool fans were guiltless. A mountain of evidence was consulted before jurors ultimately came to that conclusion. The Hillsborough fans finally have the justice (hopefully to be compounded by prosecutions of officials) that they, and in indeed the entire of city of Liverpool have fought for over two decades. Many politicians, journalists and commentators have called it the worst miscarriage of justice in Britain's history . Rather than sinking to Campbell's level, I politely asked him on Twitter if he'd retract his comments and consider apologising in light of the momentous truth. I was blocked without reply along with several others, classily branding us as "trolls". When asked the same thing by the Daily Record , Campbell again refused to respond. We must scrutinise Campbell's odious comments in the same way that he purports to scrutinise the establishment. Wings Over Scotland is a platform devoted to holding media to account and I respect that. This piece is not an attack on readers - I understand the value of new media, especially media that challenges the mainstream consensus (after all, I'm writing on one now). But Wings should be scrutinised in the exact same way. After The Sun newspaper's lies and slander of the Hillsborough survivors in the aftermath of the disaster, the good people of Liverpool decided to boycott the newspaper and, by and large, continue to do so to this day. They recognised that media must be held accountable for its actions. I would challenge readers to answer this: should we support a man who called innocent Liverpool fans "cunts" and accused a city that has suffered abuse and prejudice in the near three decades since the disaster as having an "unending, maudlin obsession rooted in guilt rather than anger"? We must scrutinise Campbell's odious comments in the same way that he purports to scrutinise the establishment. If we want new media to be respectable and sustainable then we must hold its pioneers and gatekeepers to account. If we want new media to be respectable and sustainable then we must hold its pioneers and gatekeepers to account. I call on the Yes movement to unfollow/stop reading/ignore Wings Over Scotland until he retracts his offensive comments, not to me but to the families that have suffered for 27 years. The majority of pro-independence supporters seek to create a Scotland that is fair, respectful and doesn't stand for injustice. Campbell and Wings Over Scotland do not stand for these values. Let's send him the message that he doesn't speak for us.